8pm – 11pm Morgan and Shelby are playing Jenga. 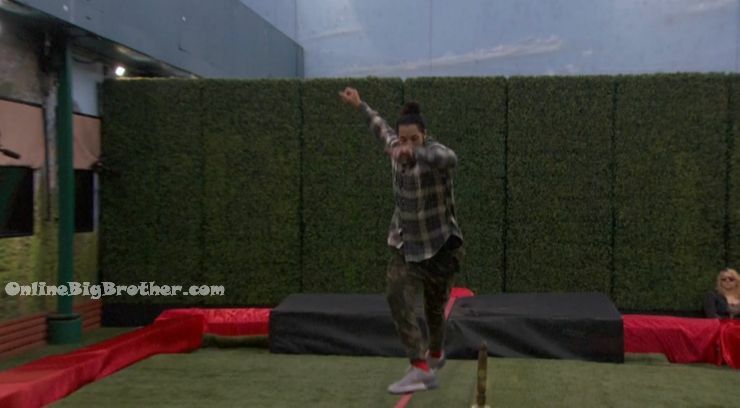 After they head up to the HOH room. They go into the bathroom. Shelby puts on her bikini and sunglasses. Shelby – get ready America we’re about to do bath time with bikini girls. Only its just going to be me in a bikini. Morgan goes and puts her bikini on over her shirt. They start their Bikini Girls show called “Bubbles and Beef Cakes” edition. Morgan – our first beef cakes .. lets do some of out own. Shane Vs Justin. 8:30pm Morgan, Jason, Kryssie and Justin are in the kitchen. Justin – I’m just so glad its over. It’s done and I’m blessed. Kryssie – so if he is safe, does that mean we have one more safety ceremony? Jason – we must. Kryssie – whatever night we don’t have a safety ceremony I’ll make peanut butter balls. Morgan – yeah I’m assuming they’ll just do it Sunday. 8:25pm Jason talking to himself. 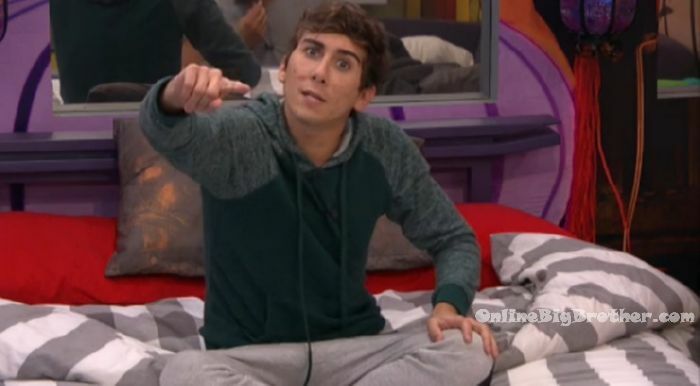 Okay, so whoever doesn’t get nominated… HAS to win the veto. Like HAS TA, HAS TA, HAS TA! Thanks for the endurance comp that I asked for … that I tanked at! I should have know that do back flips over herself would have been able to stand on that sh*t forever. 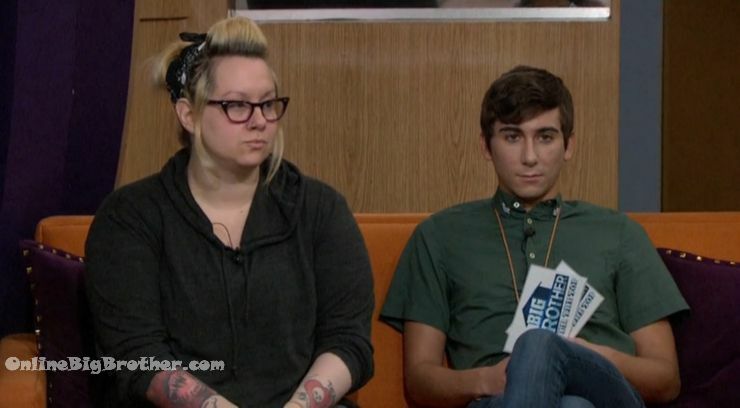 We’ve got to win the veto. f**king eh! I clearly can’t win anything. 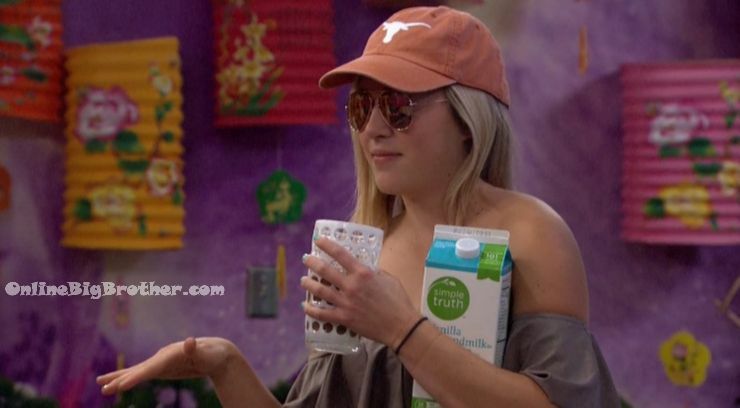 9:45pm – 11pm HOH room – Morgan & Shelby. 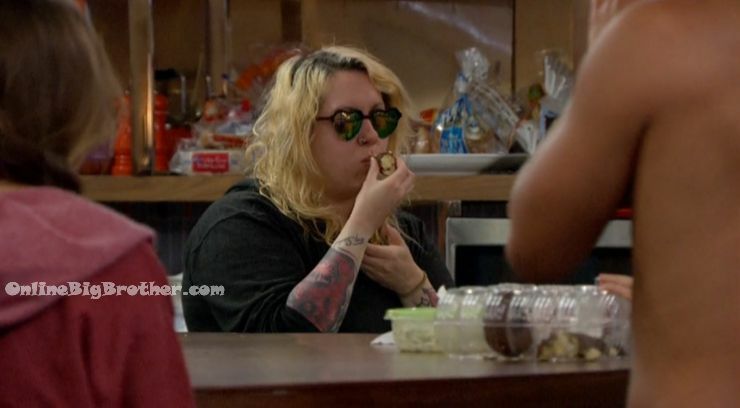 Morgan – well we know who Kryssie is going to target if she’s HOH. Shelby – probably me. Morgan – yeah it probably would be you but now Jason will have an excuse to go after me as well. 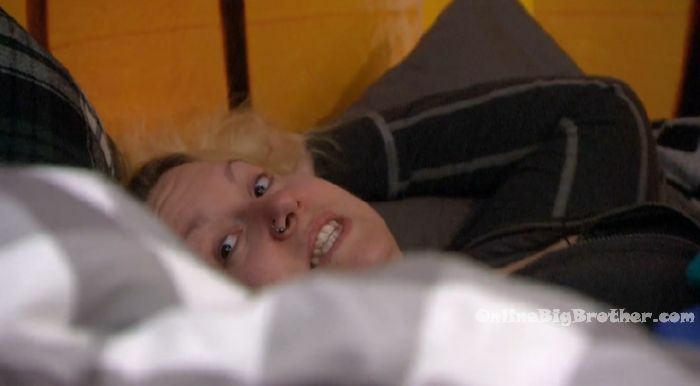 Shelby – Jason will probably still want me out if he’s smart. Morgan – see that’s the thing they’re not freaking smart! I can honestly see them be like … yeah Shelby has won more comps but lets get Morgan out because she’s going to want revenge for us getting Alex out. Morgan – Alex was my sister.. so… that was a big twist.. Jason got out my sister I’ve been targeting him.. that is why I want to be HOH..
Morgan adds that she broke her word to Kryssie earlier in the season and she’s hoping with coming to Kryssie with this truth now she can mend things. Morgan is planning on talking to Justin as well.